What is easyJet's luggage allowance? Find out here. Don't let easyJet's baggage restrictions stop you from bringing abroad all the luggage you need. Instead of trying to check everything in the hold and struggling with it on your onward journey, you can simply ship your luggage to your destination with Send My Bag. Find out how cost effective it is to do so. By sending your luggage you can avoid unexpected excess baggage fees from easyJet and can enjoy a pleasant, luggage-free journey. One item of hand luggage with dimensions no greater than 56 x 45 x 25 cm. There is no weight restriction for easyJet carry-on items. ‘EasyJet plus’, 'flexi fare', 'upfront' and ‘extra room’ customers have a larger hand luggage allowance. These passengers are also permitted to bring a second, smaller item, such as a handbag or laptop, to be placed under the seat in front. This item must have dimensions no greater than 45 x 36 x 20 cm. Additional items permitted in easyJet hand luggage include overcoats, umbrellas, and mobility aids, plus one standard-sized duty free bag. What if Your easyJet Cabin BagGage is too large? If a cabin bag is found to exceed allowances at the boarding gate, the bag will be placed into the hold and there will be a charge of £47. Musical instruments can be brought on board as hand luggage, providing they do not exceed 120 x 38 x 30 cm. These include instruments such as violins, flutes and trumpets. The instrument counts as your one permitted item of hand luggage. If travelling with an infant seated on your lap, you may bring an additional baby bag on board, with dimensions no greater than 45 x 36 x 20 cm. If infants occupy their own seat they are entitiled to the usual cabin baggage allowance, plus a baby bag. Customers on higher fares who already have a second bag are not allowed a further bag for an infant. Children over two years of age with their own seat have the same hand luggage allowance as adult passengers. If you would rather move through the airport without your cabin bag in tow, you can leave your bag at easyJet Plus bag drop and pick it up again at the luggage carousel once you reach your destination. The cost of purchasing 'Hands Free' at the airport or online is now £6. Compare easyJet's hand luggage allowance to that of other airlines. Passengers are permitted to check into the hold up to three bags, each measuring no more than 275 cm in total (length + width + depth). The standard easyJet hold luggage allowance is 23 kg per bag (for bookings made from November 2017). 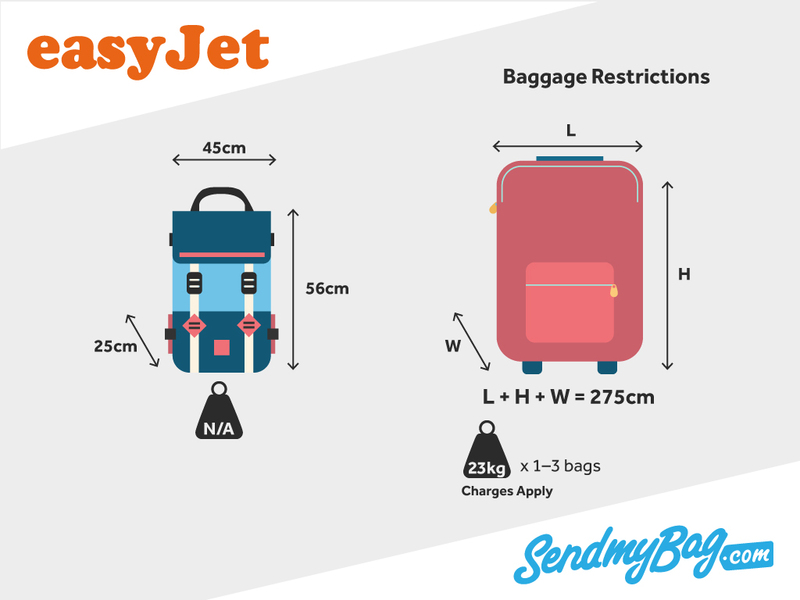 The easyjet hold baggage cost for 23 kg is between £13.99 and £33.99, one way, depending on the route and flight period, or £37 when paid at the airport. A smaller allowance of 15 kg can be purchased online for between £8.99 and £29.99. If a bag weighs more than a passenger’s pre-paid allowance of 15 kg or 23 kg, excess baggage fees will apply. These are £10 per kg, one way, if paid at the airport. Bags must not exceed 32 kg. Sports equipment, such as skis, may be checked into the hold, at a cost of £37, one way, for a small item (max 20 kg) and £42 for a large item (max 32 kg), if booked online, or £47 and £52 respectively if paid at the airport. easyJet allows musical instruments to be checked into the hold. This is charged according to the standard checked luggage rates. EasyJet introduces ‘Hands Free’, a scheme that allows passengers to leave their cabin bag at bag drop so they don't have to carry it through their departure airport. The cost is £4 per person, one way. Passengers must pick up their luggage at the luggage carousel on arrival at their destination. Looking for easyJet sized hand luggage?